British racer Alex Lynn signs a multi-year contract for DS Virgin Racing Formula E team to contest in the forthcoming 2017/2018 Formula E season. The DS Virgin Racing retains Sam Bird for his fourth season with the team so they will have all-British driver line-up in the next season. The 23-year-old Alex Lynn was the team’s official reserve driver earlier this year, participating in two New York’s races, alongside his commitments in other racing competitions, such are FIA World Endurance Championship with G-Drive Racing, IMSA SportsCar Championship with Wayne Taylor Racing or 24h Nurburgring with BMW Team Schnitzer. Earlier in a career, Lynn was the 2011 Formula Renault UK Champion, 2013 Macau F3 Grand Prix winner and 2014 GP3 Series champion. In June this year, he made his Formula E debut for the team in New York, securing pole position on his first attempt and becoming only the second driver to have ever done so. 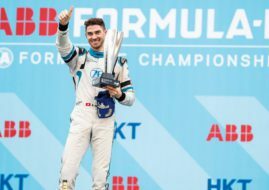 Lynn will replace Argentinian Jose Maria Lopez who made his Formula E debut with the team last season. “I am over the moon at being promoted to a full-time drive with the DS Virgin Racing Formula E Team. Having worked very closely with them since January this year, it has been a genuine pleasure to learn from such a fantastic group of high quality engineers and to integrate myself into their set-up. Indeed, I have been made to feel very welcome throughout their organisation and I would specifically like to thank Alex Tai for not only giving me the chance to make my series debut in New York, but for subsequently promoting me to this full-time race seat. I am currently enjoying helping the team to further develop the car and intend to fully repay everyone’s faith in me on track next season,” said Lynn.